Mary Helene Rasmussen Jackson has been researching and writing about Katharina von Bora’s life for more than 30 years. 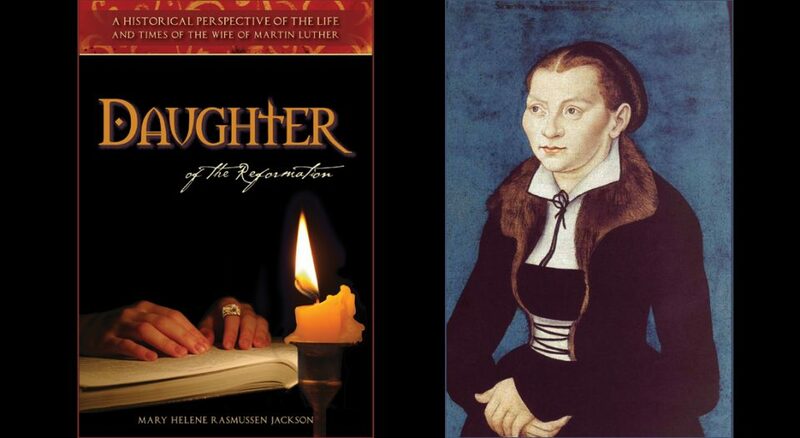 A four-part monologue about von Bora that Jackson continuously developed and took on the road provided the foundation for her book Daughter of the Reformation: A Historical Perspective of the Life and Times of the Wife of Martin Luther (Huff, 2015). As we commemorate the Reformation’s 500th anniversary, Living Lutheran spoke with Jackson about life in the early 16th century, and the way von Bora’s bold example continues to inspire believers today. Living Lutheran: It’s easy to forget how different life was during the Reformation. Could you paint a quick picture of early modern Europe in 1517? in the windows. It was a very dark time, and the streets weren’t clean. They were full of trash and sometimes dead bodies. But it wasn’t just that—it was the fact that [people’s] minds were also entrenched for generations in ignorance and in darkness. They had a great fear of the devil and were convinced that the devil lived in all sorts of forms right there in their own forests, their own towns, up in the clouds. Also, the wrath of God was so paramount at that time. It wasn’t a loving God that they were taught about. [God’s wrath] was what they were taught by their mothers and their grandfathers and certainly by the church, which was overriding. It was a frightening time to be living because the common man really had no voice and was under the thumb of the few noble landowners, and then, of course, of the church—and [there] was an eternal fear of what would happen to them when they died. It’s clear that Katharina was no ordinary woman for any time, but especially for her own. Would you talk a bit about that? I feel she was extraordinary for a lot of reasons. For one, she was a very independent person because she dared to leave the convent—that was no small thing in those days. For example, if anyone helped her do it and was caught, they could be beheaded. Nuns who were caught leaving were often put into solitary confinement for some time thereafter. So she dared to do that for her own personal reasons, and then she also dared to challenge Martin Luther because he thought he would set her up with [one of] two or three [potential] husbands, and she wanted none of it. She married him with the full knowledge that she would be shamed, that people would point fingers at her, because here was a monk and a nun—people who had promised to be celibate their entire lives—suddenly getting married. People were not good to her. When you look at the Scriptures that she liked, it was often “I have been through much travail” and that sort of thing. So she was brave, but she had to be real. That, I think, is the thing that people nowadays have to accept about historical figures—they were real people who hurt and cried and laughed and had joy or otherwise. There are some poignant quotations from Luther about her reactions and demeanor when her two daughters died, and then, at the end, when he was gone, how she said, “He was my best friend. There’s nobody else I can talk to.” She was a real woman, and if our folks today can look at those people who lived and died [during the] Reformation and know that they are just as real as we are, that we are more alike than we are different, I guess that is the key to loving history. How has your experience researching and writing about Katharina’s life influenced your everyday life and faith? What is maybe most paramount for me is that in everything I do each day—whether it is cooking, or caring for grandchildren, or planting gardens or waking up early in the morning and loving it—I feel a kinship with her in that way. … The little things of life all built together to make something that really was part of the change of not only her society, but Western civilization at that time. I don’t think [Luther] could have done what he did without her. I truly think if she were here today, she would understand us and we would understand her. … You wouldn’t think of her as a name in a history book, but someone who dared to be a forerunner for the rest of us.